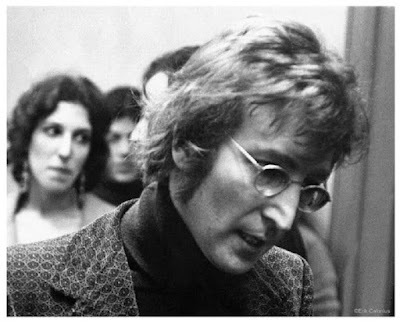 This photo shows John as he leaves the courtroom after watching the trial for the murder of Margit Sugar on January 12, 1972. A journalism student named Erik Calonius was lucky enough to be assigned to report on the trial when John Lennon, Yoko Ono, and Abbie Hoffman showed up unexpectedly to watch the goings-on. Calonius spoke to John briefly about the case and snapped this photo of him after court that day. Steve Marinucci has written an article about this, which is well worth reading. John Lennon also attended the Watergate hearings. How many American citizens did?